EPA's annual Top Cities list shows which metro areas were home to the most ENERGY STAR certified buildings in the previous year. These regions continue to make impressive strides in cutting American energy bills and pollution through energy efficiency. Their efforts contribute to stronger economies, healthier communities, and cleaner air for all of us. We defined cities based on the US Census’ “core based statistical areas,” commonly known as metropolitan areas. We then tallied the total number of buildings that had earned the ENERGY STAR in each metro area in 2017 and ranked the cities accordingly. ENERGY STAR certified buildings are verified to be more energy efficient than 75% of similar buildings nationwide. Thanks to their efficiency, they use an average of 35% less energy than typical buildings, and cause fewer emissions—including 35% fewer greenhouse gas emissions. More than 32,000 diverse buildings have earned the ENERGY STAR since 1999, ranging from the Empire State Building to an elementary school in Alaska. Together, these buildings have saved more than $4.5 billion on energy bills and helped achieve broad emissions reductions—including greenhouse gas emissions equal to the annual electricity use of more than 3 million homes. The availability of energy use data continues to increase—including real-time data in 15-minute intervals. Facility managers used to have to wait until the monthly bill came before they realized there was a problem. Now they can see variations in energy use almost immediately, which makes it easier to identify, find, and fix problems. LED lighting goes mainstream. First it was used in areas like parking garages, but as prices have come down we’re seeing more interior LED retrofits, as well. Building automation systems make buildings smart. You can program all your equipment to go on and off at certain times. You can also remotely monitor and control your equipment from off-site. This is similar to smartphone apps for homes, where you can turn the lights on and off and set the thermostat while you’re away. We can’t pinpoint the specific reasons why more than 700 L.A.-area buildings applied for and earned the ENERGY STAR last year—that’s 185 more than last year. However, a relatively new law in Los Angeles may be worth noting. It requires commercial and multifamily buildings greater than 100,000 square feet to track and report their annual energy and water use using EPA’s ENERGY STAR Portfolio Manager tool. The law also requires that energy utilities provide aggregated energy consumption data, which makes it easier for these buildings to track and measure—and therefore manage—their energy use. MGM Studios Headquarters, Beverly Hills, Calif. This sleek glass building in the heart of Beverly Hills serves as the home of MGM Studios. National Geographic Society Headquarters, Washington, D.C. The 1963 headquarters for the National Geographic Society also serves as a museum showcasing explorations from around the world. This year, the building was nominated to become a national historic landmark. When completed in 1931, this 102-story Art-Deco building was heralded as an unprecedented marvel of the modern mechanical age. Now, more than 80 years and one deep energy retrofit later, the historic structure once again serves as a modern marvel—this time, of energy efficiency. The Philadelphia Ronald McDonald House, Philadelphia, Pa. Originally built as a Victorian-era Romanesque mansion in 1885, this building now provides accommodations for families of seriously ill children undergoing treatment in local hospitals. It was the first Ronald McDonald House Charity in the country. Cambridge Savings Bank, Cambridge, Mass. Built in 1820, the Cambridge Savings Bank building in Harvard Square was the oldest building to earn the ENERGY STAR last year. 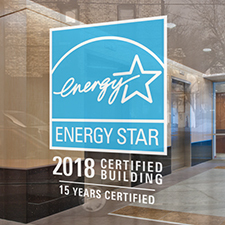 ENERGY STAR certified buildings are verified to perform in the top 25 percent of similar buildings nationwide over a specific one-year period. On average, these buildings use 35 percent less energy and cause fewer emissions—including 35 percent fewer greenhouse gas emissions—than their peers. ENERGY STAR certification is awarded based on a single year of actual, measured energy performance. Certification is valid for one year.